HONG KONG/JAKARTA — Cardinal Joseph Zen, former bishop of Hong Kong, has criticized the Vatican for being “unfaithful” to its subjects in striking a deal with Beijing on the appointment of Chinese bishops, which he believes would eliminate the very few freedoms enjoyed by unofficially sanctioned “underground” churches in China. Zen’s comments come after reports emerged that Pope Francis has decided to accept the legitimacy of seven Catholic bishops chosen by the Chinese government as part of a rapprochement between the Vatican and Beijing after decades of cool relations. Such acquiescence implies that although the pope is the one who appoints the bishops, it was the Chinese government that chose the candidates. “[Beijing] wants the Vatican to [help] get all these birds into the cage,” Zen told media in Hong Kong on Friday, referring to the appointments. Beijing only recognizes certified religious groups, meaning Catholics have been forced to choose between the government-backed Patriotic Catholic Association and the “underground” church loyal to the pope and the Vatican. Tong said that the seven state-backed bishops had written to Pope Francis seeking full church recognition, missives that presumably would not have been sent without Beijing’s approval. The acceptance of the seven bishops could be seen as a pragmatic step taken by Pope Francis to tap into the enormous potential China offers for expanding Christianity. China and the Vatican cut official ties in 1951 but have been in an uneasy on-off dialogue since the 1980s over the rights of China’s estimated 10-12 million Catholics. The stand-off pits the government-backed Patriotic Catholic Association against “underground” Catholics loyal to the Vatican who see the state-run counterpart as illegitimate. For its part China has long appeared of the view that because the Vatican is a state known officially as The Holy See, Catholics could be disloyal. That concern does not typically arise in other countries with substantial Catholic populations — though John F. Kennedy, the first Catholic to win the U.S. presidency, was cornered into promising he would put his religion second when it came to policy-making. But when reports emerged recently that the Vatican was asking its bishops in China — some of who have been detained as prisoners of conscience — to step down in favour of state appointees, there was uproar among some Catholics overseas. Catholic church appointments are based on the concept of apostolic succession — that clergy appointments can be traced back to Jesus Christ telling the 12 apostles they could nominate colleagues and successors, who in turn could do likewise. China’s state appointments are seen by Catholics as breaching this lineage. “All of these are fake,” Zen said of the seven Chinese appointments. He said it was impossible to have democratic elections in China, and that the nomination conference was controlled by the Communist Party who would not choose good candidates for the Catholic church. 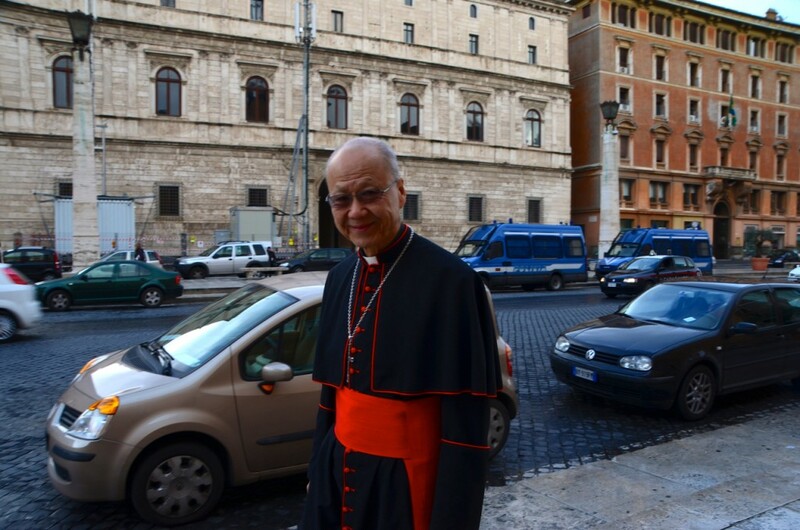 Zen, a long-time critic of China who backed the Umbrella Movement pro-democracy protests in Hong Kong in 2014, traveled to Rome in January where he met Pope Francis, apparently giving the pope a hand-written letter from a Chinese underground bishop. According to Zen’s account of the discussion, Pope Francis said he did not want “to create another Mindszenty case.” Joszef Mindszenty was a cardinal in Budapest who was imprisoned by Hungary’s communist rulers before he took refuge in the U.S. embassy in 1956 during an uprising against the government. He was eventually asked by the pope to leave his homeland as part of a compromise with the Hungarian communists. But Zen ended his account of the meeting by expressing his fears that the Vatican was “selling out” to China. Zen previously questioned Pope Francis’ understanding of China’s communist government, saying that the Argentinian pope might be seeing the issue through the prism of the “persecuted communists” of Latin America — where right-wing military dictatorships backed by the U.S. purged leftists during the Cold War era, when Pope Francis was a young Jesuit priest. “The holy father may not know everything,” Zen said on Friday. “People around him may not tell him the whole reality…They are too eager to succeed in striking the deal with China. Zen’s latest comments come after some notably sharp exchanges with other senior Catholic clergy, who do not typically criticize each other in public. “It is therefore surprising and regrettable that the contrary is affirmed by people in the Church, thus fostering confusion and controversy,” Burke added, likely referring to Zen. Zen said he was not worried about being sidelined. “The only one who can tell me to shut up is the holy father,” he said. Zen has drawn support online from young Hong Kong Catholics as well as from prominent Catholic commentators in the West. The perception that the Vatican was capitulating to Beijing was fuelled by comments made last week by Archbishop Marcelo Sánchez Sorondo, the head of the Vatican’s Pontifical Academies for Sciences and Social Sciences. Criticising the U.S. and describing China as “extraordinary,” Sorondo said China’s communist rulers could prove “best [at] implementing the social doctrine of the church “ — despite China’s official atheism, lack of political freedoms and its one- and two-child policies, which have been implemented by the widespread use of abortion, sometimes coerced.